My summer began beckoned to Coaling Island. What mystical attraction reeled me in? Social media is a great thing. A family member had posted that local fishing enthusiasts were selling their catch off their boats and posted a phone number. I called and arranged that I’d swing by to pick up a couple of kilos of their recently caught tuna. 3.8Kg of tuna later I made my way home thinking of all the delicious recipes I was going to create with ‘my’ catch. 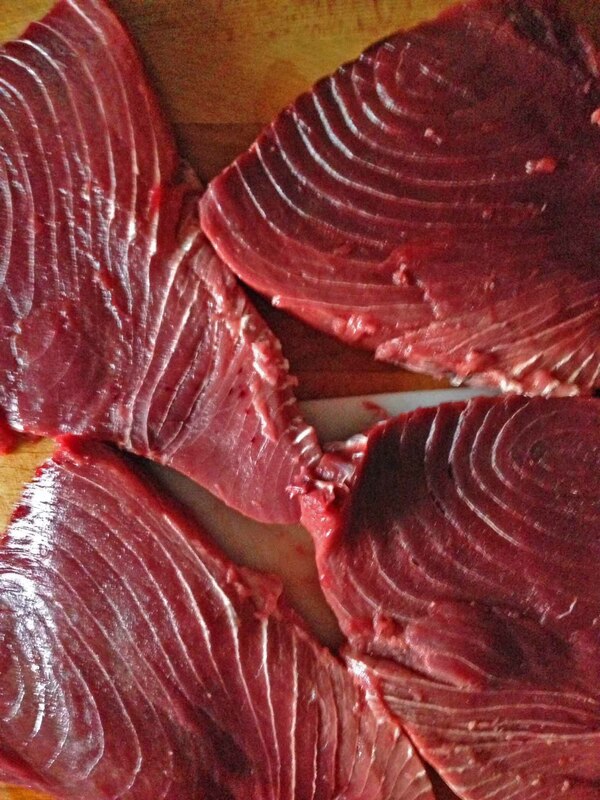 Most however were going to involve a tuna steak; grill marked and quiveringly rare or cubed and made into pinchitos. No exciting sauces – none needed when the product is this fresh. I went to work cutting the 3.8Kg hunk of tuna into decent sized steaks ready for my tuna dinners throughout the summer. I made sure to cut a chuck off that I was going to use immediately in an experiment: maki sushi rolls. I have never made my own maki rolls before but they are remarkably simple to make. All you need is a bamboo rolling mat, nori (dried seaweed sheets) and any fish/veg/meat that you wish to use. Most supermarkets stock these items but Ramsons stocks all of the asian components needed. The most important thing to get right when making sushi rolls is the rice. Make sure to buy sushi rice which is more glutinous once cooked. Once cooked, add rice vinegar with dissolved sugar and salt. Mix it well and set to cool. Chop the cucumber into batons, slice spring onions and cut the avocado into slices (I didn’t have any ripe avocadoes so left them out.) Sesame seeds to either sprinkle over or use around some types of maki roll are an optional extra. Pickled ginger as a palate cleanser, soy for dipping and wasabi to spice it up make the whole experience more authentic. Please note: Sushi recipes will always ask for “Sushi-grade” tuna/salmon. This is fish that has been frozen for at least 7 days at -20˚C to kill any parasites. 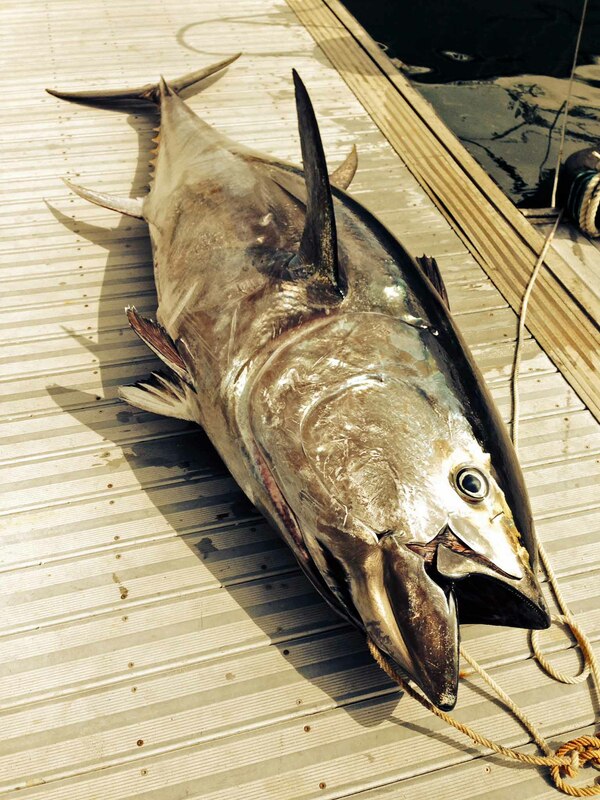 However, bluefin tuna, yellowfin tuna and farmed salmon are exceptions. Considering how easy it was to make I will definitely be trying to make these maki rolls again. It would be something fun to do with other people round: DIY Dinner. 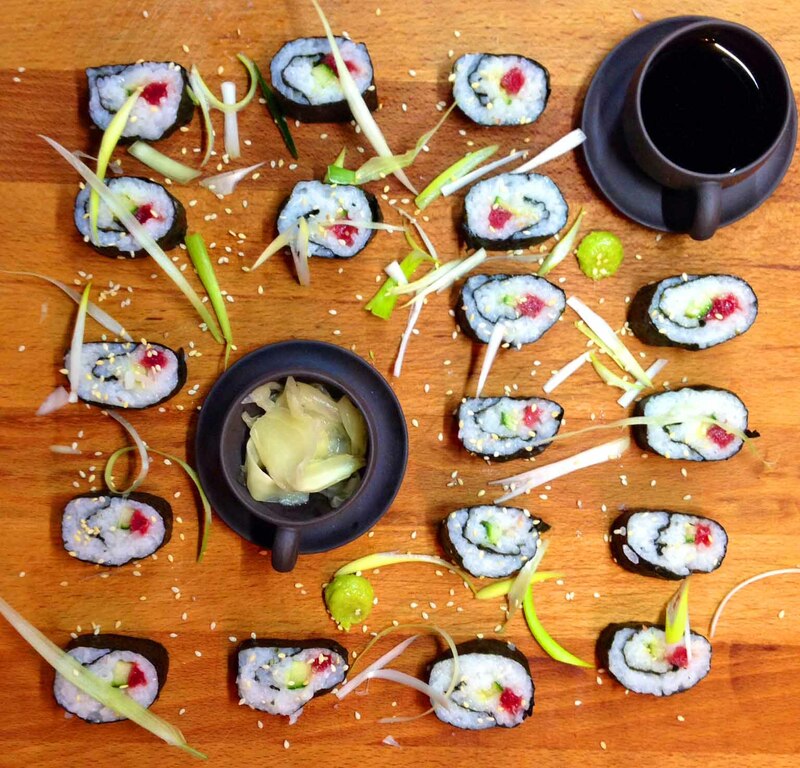 If you’re up for a night of sushi making let me know – the combinations are endless.